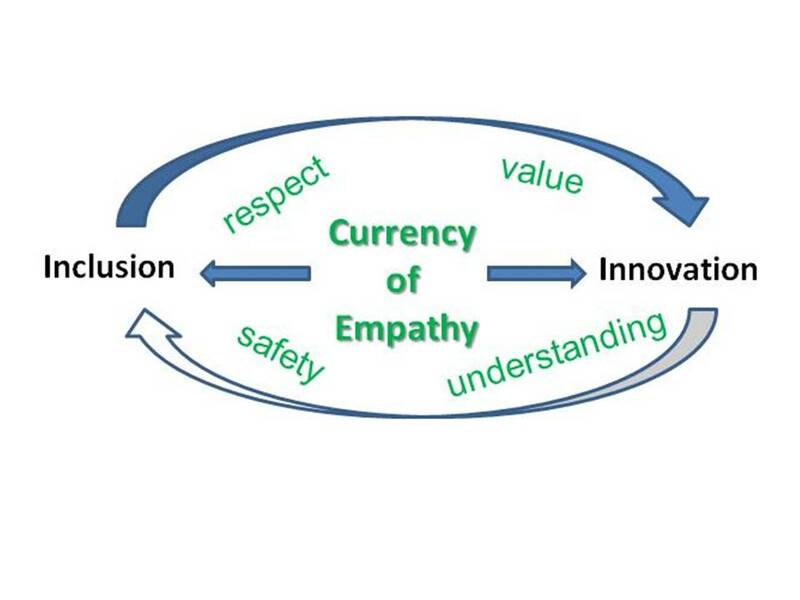 Can you imagine how a “currency of empathy” supports innovation? Innovation requires change, which is hard for human beings even when it’s good. Change brings fear, loss, frustration, and even rewiring of our brains. Empathy helps us move through all of this, as well as fuels our willingness and desire to celebrate success together. True inclusion requires being able to hear what others contribute, and that they feel safe and able to communicate disparate views. Inclusion starts with valuing rather than judging each human being. Think about the groups in which you feel safe to be yourself and say what comes to mind. The currency of empathy is flowing there. Innovation and inclusion reinforce each other as well. Insights often come from a collision of disparate views, so inclusion of disparate talent is vital to innovation. Finally, if you have been in innovative, growth environments, you know that inclusion is easier there vs shrinking, scarce environments because there is plenty of “pie” for everyone.